Do you LOVE your refrigerator? 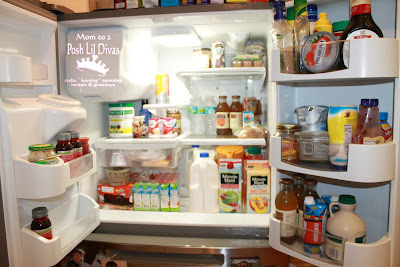 I can honestly say that my entire family LOVES our Maytag Ice20 French Door Refrigerator! This fridge has so much SPACE! Seriously, it is awesome. I don't know how we ever managed without it but I know that I can never go back. ALL my bottles fit - and while they are standing up. That was a huge problem with my old fridge. I used to have to screw caps on tight and lay our juice down. I can not tell you how many spills we endured over the years. Yuck! Seriously, look at all those shelves and they are adjustable too - swoon! There's even a wine bottle holder, though currently I see I have some salsa in there. Never mind that, the option is pretty cool and we have made use of it. You know how difficult it can be to store wine in a regular refrigerator. The bottles are usually too tall for the shelves. That problem is solved here because it's an open space - perfect for even those tall wine bottles. Take another peek at the photo above. Do you notice that even the shelves on the doors are spacious? We have so many bottles - condiments, syrup, jellies, cream cheese, etc. It all fits and having them there provides super easy access. I don't have to hunt in the fridge. This also means that the food in the refrigerator is fresh. Yeah, I am loving that. No more forgotten about and expired food. I literally used to lose food in the fridge. Piling things up, moving them to the back - whatever it was, I always ended up with so much food that went to waste. No more! We can see everything so we actually remember to eat it and I don't buy doubles of things I didn't see but end up not needing. This year, we hosted Thanksgiving. I used to have to keep food in my mom's refrigerator in years past whenever we had a large gathering. Food and extra drinks simply did not fit. Not the case this year. I was actually showing off how many things I could pack in our fridge. I had soda cans, iced tea bottles, water bottles, sangria, beer and dozens of juice boxes and that was just the liquids. 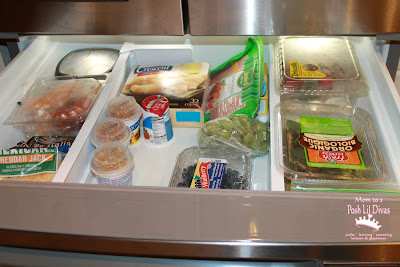 I was able to fit all of our food in the refrigerator over night - turkey, pork, salads & sides and desserts. I'm actually worried now that it went too well. My mom may never want to play host again. Are you falling in love too? To think, this is just the top of my swoon worthy refrigerator. I still have 2 more drawers to share with you and some cool features. I am seriously giddy with excitement. One of my favorite features of the Ice20 French Door Refrigerator is the easy access drawer. All our fruits, veggies, yogurt, cheeses and even some juice boxes get stored there. This means no little hands trying to open the fridge drawers all day long. When the Lil Divas want a snack, they head straight for this drawer. Confession - so do I! This is such a great way to store snacks, fruits and other small items that get used often. It also conserves energy by keeping the main refrigerator compartment closed while still allowing access to those frequently requested food items. Another energy saver - it even has LED interior lighting. Did you see the freezer? Since I'm being brutally honest with you I have to admit that at first, I was worried all my food wouldn't fit. I wasn't used to having drawers like this. It seemed so much smaller to me. Well, I am not ashamed to admit that I was wrong. Check out the side view - those shelves are deep. I can fit A LOT in there. Now that I have given you a sneak peek at the inside of our refrigerator and you all know the layout plus what we are eating these days, how about I share some of our favorite features? Besides the easy access drawer, the other feature that the Lil Divas love the most is the ice and water feature. They love being able to fill their water bottles without the mess of spilling our large bottles or jugs using the measured fill option. Yes, a measured fill. 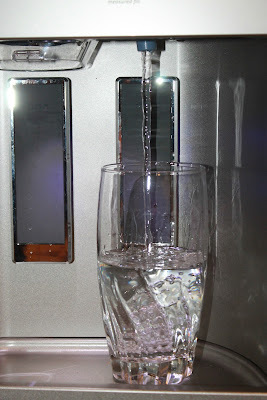 I like that the water and ice comes from a PUR water filter which only has to be changed twice a year. Fabulous! Ok, go ahead and admit it. You are wishing you had my refrigerator. Well, while you certainly can NOT have mine - I have grown way too attached to it. 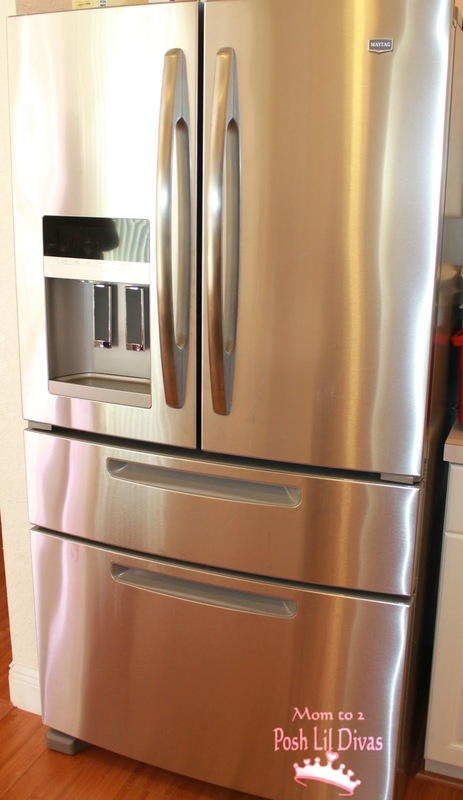 You can easily purchase your own Maytag Ice20 French Door Refrigerator. What a great holiday gift! Don't forget to check out Maytag on Twitter and Facebook for all the latest news. What do you think of your current refrigerator? Can you use a new one? What do you think of the Maytag Ice20 with easy access drawer? Disclosure - I wrote this post participating in an Maytag Moms Dependable Kitchen Ambassador program by Mom Central Consulting on behalf of Maytag. I was provided with a Maytag kitchen appliances set, including a refrigerator, microwave, dishwasher, and range to facilitate my post. I would love to have your refrigerator! I thought I commented on this already... LOVE your fridge!!! 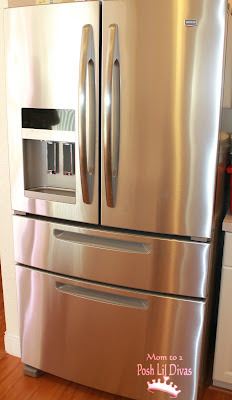 I nixed the french door option when we bought our recent fridge but now I am wishing we had gotten one! Looks like it has more space than the one I have. It is amazing how a beautiful fridge totally dresses up your kitchen. So excited you got this! Your fridge is gorgeous! I have a Maytag dishwasher that I LOVE! I love how much room there is in the doors. Our Maytag has the same doors and it makes fitting all of the little extras so easy! I'm in awe. And green with envy. I need a new fridge so bad... just waiting for the day that a new kitchen is in order (hopefully in the next year or two!) - I'd love to have all Maytags, I got nothing bad to say about them!! Wow! Your fridge is AMAZING! I love how well organized everything is...and so much space! Awesome!